As leading experts in the art of veneer and smile makeover dentistry you can rest assured that both Neresh and Usha will give you the perfect smile that you have always dreamed of. We offer a wide range of the very latest veneer systems including same day immediate veneers, Lumineers veneers from California and hand-crafted bespoke veneers made in the UK. Veneers are thin, strong sheets of porcelain which are bonded to the front of the teeth to improve smile aesthetics. They can remove any traces of imperfections, straighten smiles and rejuvenate tired, dull looking teeth. Porcelain is the most popular material for creating dental veneers as it is strong, glossy and able to mimic the natural appearance of teeth. During your initial consultation we will talk about the problems you are having with your smile and determine what you would like to change. We will then examine your mouth and teeth to see how many veneers will be needed. You will be involved in the creation of your new smile and be consulted regarding the colour, shape and appearance of your veneers. Only when you are happy will we move onto the next stage of treatment. This stage of the treatment involves preparing the tooth for the veneers. An impression of your teeth will then be taken and sent to our off-site laboratory with your specific measurements. While you wait for your permanent veneers a set of replica veneers will be fitted to help you experience the feel and appearance of your new veneers before they are permanently bonded to your teeth. You will also be able to make adjustments to your veneers at this time. You will then return to the practice to have your new veneers fitted. You can request changes before this time during the temporary or trial smile stage. 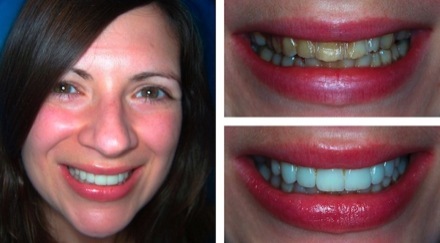 Once the veneers are permanently fitted to your teeth changes will not be possible.